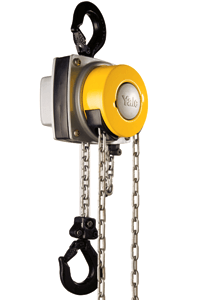 The Yale 360 is flexible, compact manual chain hoist with 360 degree hand chain rotation. The Yalelift 360 manual chain hoist has an innovative design which is favoured by many industries. This is due to the different hand chain layout, flexibility of use and exceptional operator safety. 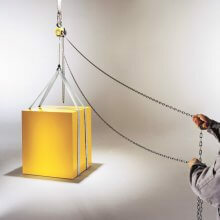 This is a fairly compact hand chain hoist with a low headroom design which enables maximum lifting heights. 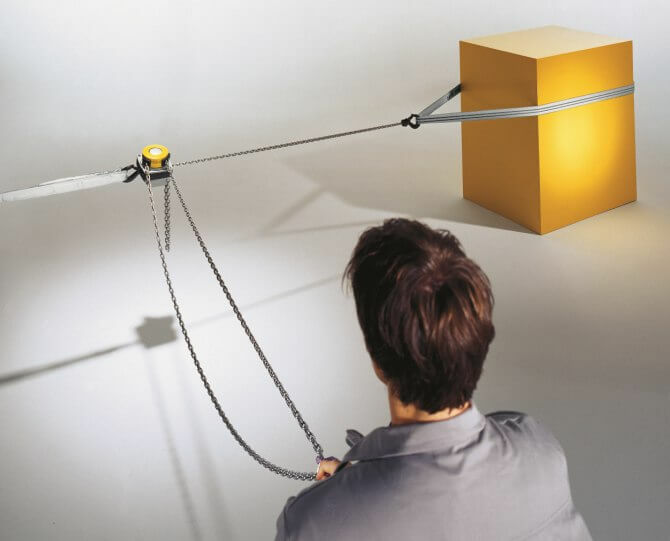 The hand chain guide rotates through a complete 360 degrees. This enables the user to operate the hoist from almost any position at any angle, as long as the plane between both hooks is always straight. This also provides the highest safety for the operator because they can position themselves away from the most hazardous area where the load is being lifted. 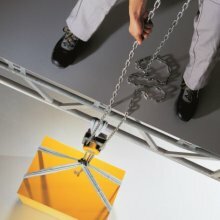 This revolutionary Yale 360 chain block even enables the user to operate the hoist from directly above. 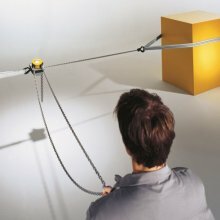 This permits the use of a fairly short hand chain but with a longer than average load chain. 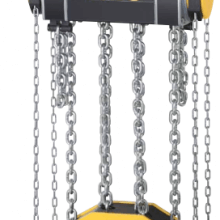 Due to the fact that this Yalelift 360 manual chain hoist can be used in all directions it can be utilized for more than just lifting and lowering loads, pulling and tensioning operations are no problem for this manual hand chain hoist. Chain movement is smooth and precise on both the hand chain and the load chain; the sheaves for the chains are hardened steel, they have been precisely machined with 4 pockets to perfectly match the chain links (the 20 tonne model has 5 pockets) and together with the fully encapsulated ball bearings you can be assured of smooth, precise and almost effortless operation. 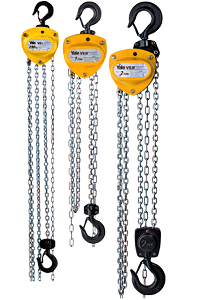 The brake system of the Yale 360 manual chain hoist has very good wear resistance and is quiet in operation. The brake design guarantees operational safety and because there are no ratchet pawls in the system, serviceability has been greatly improved, as pawl systems are often the most vulnerable part. Both the gearbox and the chain guides are practically entirely covered which ensures maximum protection under tough conditions. The outer steel housing further protects all internal parts of the hoist. 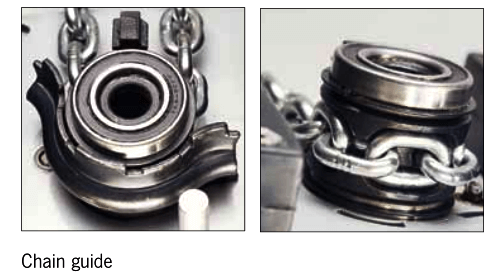 The load chains are alloy steel which have a zinc plated surface finish for added protection. The top and bottom hooks incorporate robust safety catches and swivel through 360 degrees; they are made from drop forged high tensile steel and will yield under overload not break. 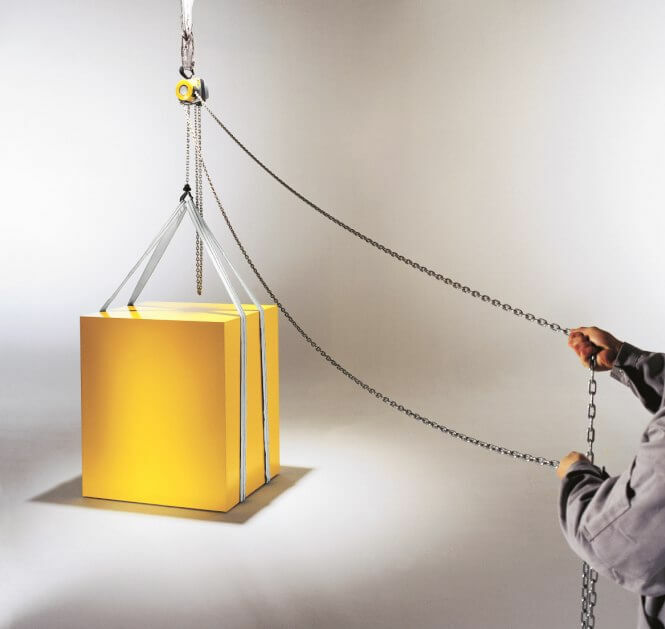 The standard Yale 360 chain block is available with safe working loads up to 10 tonne / 10000kg; we can also supply a 20 tonne / 20000kg model which has six chain falls. We supply this hoist with a 3 metre height of lift as standard though we can add to this length of chain to your requirements. 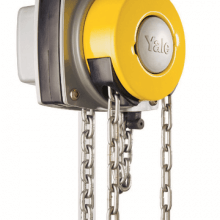 Additional options available include a chain container to safely store and protect the chain and an adjustable overload protection device; we can also supply the Yale 360 in a corrosion resistant version and an ATEX rated version. The flexibility of these manual chain hoists is second to none and it complies with all the necessary regulations; as with all Yale products you can be assured of high quality and reliability.